Join us for an all-ages musical extravaganza that promises to entertain adults and kids alike. The Human Lard Dog is a cartoon character come-to-life who descends from planet Belopio on his Giant Pretzel to take you and your family on a musical journey of absurdism, frivolity, and unbridled joy. 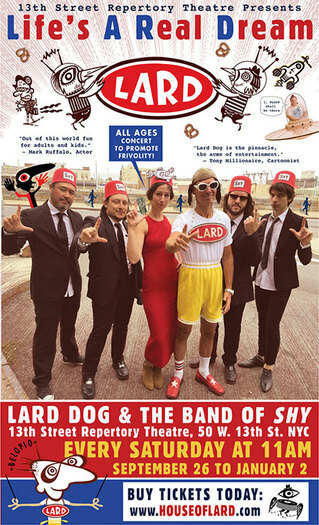 Lard Dog and his 6-piece Band of Shy invite you to their unique audio-visual universe complete with catchy songs, multi-media graphics—including art by star cartoonists Tony Millionaire and Sam Henderson— and a pretzel toss! Come play along and slurp the noodle of life! After all, Life's A Real Dream. Please click on a star rating for LARD: Life's A Real Dream // All-Ages Musical Extravaganza. Please type your review for LARD: Life's A Real Dream // All-Ages Musical Extravaganza.